The global market for hot melt adhesives is gaining significant impetus from the rise in the trading activities, leading to a high demand for packaging. The increasing construction activities across the world is also fueling the need for hot melt adhesives substantially. On the other hand, the volatility in crude oil prices and the easy availability of substitutes are likely to create hindrances in the higher adoption of hot melt adhesives across the world in the years to come. Overall, the worldwide market for hot melt adhesives is expected to report thriving success over the next few years, rising at a CAGR of 5.20% between 2016 and 2024. The opportunity in this market is projected to increase from US$6.00 bn in 2015 to US$9.44 bn by the end of 2024. The global market for hot melt adhesives is spread across Latin America, the Middle East and Africa, North America, Europe, and Asia Pacific. With a share of more than 33%, Europe led the global market in 2015. However, following the gloomy economic condition and the Brexit referendum, the market may witness a slight decline in its market share over the forthcoming years. 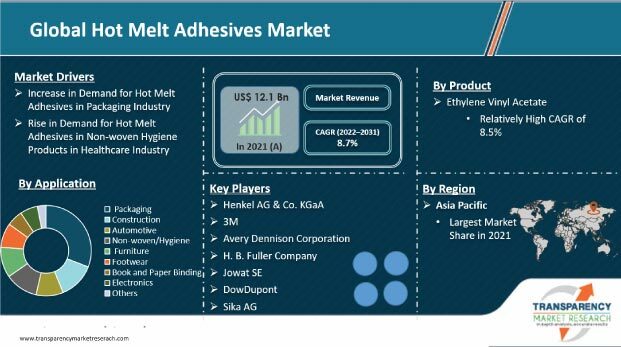 Asia Pacific, on the other hand, is anticipated to emerge as the most promising regional market for hot melt adhesives in the near future, thanks to the increasing construction activities and demand for packaging as Asia Pacific is considered as the global hub for trading activities. China is anticipated to lead the Asia Pacific market over the next few years. Several other countries in this region, such as India and Japan, are also projected to report a high demand for hot melt adhesives in the years to come. Among other regional markets, the Middle East and Africa is expected to witness moderate to high growth while Latin America is anticipated to report a slow progress over the next few years. Ethylene vinyl acetate, polyamide, polyurethanes, and styrene block copolymer are the key types of products available in the global hot melt adhesives market. Among these, the demand for ethylene vinyl acetate is higher than others. Researchers anticipate this trend to continue over the forthcoming years, owing to the low price of ethylene vinyl acetate-based hot melt adhesives and their increasing popularity in the packaging and the construction sectors. Polyurethane is also projected to experience a significant increase in its demand over the years to come. The packaging, construction, non-woven, book binding and paper binding, furniture, footwear, and the electronics industries have surfaced as the key end users of hot melt adhesives. The packaging industry has been reporting the most prominent demand for hot melt adhesives and is expected to retain its position as their leading consumer over the coming years. The construction sector is also projected to report a high demand for hot melt adhesives in the near future. The global hot melt adhesive market is fragmented with a number of players operational in it. 3M Co., H.B. Fuller, Henkel AG & Co. KgaA, Hexcel Corp., Dow Corning Corp., Heartland Adhesives, Sika AG, Bostik Inc., Jowat SE, Toyobo Co. Ltd., and Avery Denninson Corp. are some of the leading vendors of hot melt adhesives across the world.